Newcastle United were dealt a cruel blow as Willy Boly rose above Martin Dubravka to head in a 95th-minute equaliser for Wolverhampton Wanderers at Molineux. 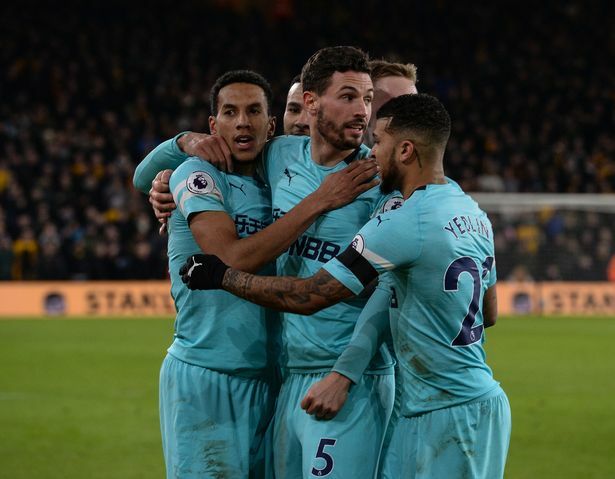 The Magpies had taken the lead through Isaac Hayden’s 57th-minute strike, which was parried into his own net by Wolves goalkeeper Rui Patricio, and had looked set to depart for their five-day training camp in Spain with a welcome three points. However, substitute Adama Traore curled a cross into the box in the 95th minute - only four were displayed by the fourth official - and Boly rose above Dubravka, who allowed the ball to slip through his arms, to power in an equaliser. It has been a challenging past eight or nine months for Hayden - but the midfielder has emerged from these six weeks or so with immense credit. The 23-year-old handed in a transfer request during the summer as he pushed to move closer to his daughter and her mother in South Wales, but Benitez would not permit the midfielder to leave unless a replacement arrived first. After a difficult first half of the season, during which he barely featured, Hayden had hoped to depart in January - but three midfielders being unavailable meant he soon became a fixture in the United starting XI. What’s more, not only has Hayden been playing in recent weeks, he has also been excelling - and this goal was just reward for him following the disappointment of finding out he would not be reunited with his family until May at the earliest. Deployed in a role slightly more advanced than he is used to, Hayden had attempted to get involved in attacks throughout the first-half. But it was in the 57th minute when he made a telling contribution. Newcastle switched play from left to right quickly, Fabian Schar fed a delicious ball to Hayden, who ran into the area and lashed a shot at goal. Rui Patricio could only parry it into his own net, and the Magpies suddenly had a lead to defend at Molineux. Hayden was tremendous throughout and, despite having a transfer request in, was applauded off by Newcastle fans when he was replaced by Mo Diame late on. Even if these are the final few months of Hayden’s United career, he is certainly going to give his all for the cause, just as he promised he would. Benitez is a manager who can spring a selection surprise out of nowhere - but he did not do so at Molineux. Instead, the United manager decided to keep faith with the team who have served him so well in recent weeks by naming the same starting XI who defeated Manchester City 2-1 and narrowly lost 1-0 away at Tottenham Hotspur. That prevented soon-to-be-club-record signing Miguel Almiron from making his full Magpies debut, though the Paraguayan was named among the substitutes. But what it did mean was that academy graduate Sean Longstaff and in-form Hayden were rewarded for their stellar performances so far in 2019 with another Premier League start apiece. 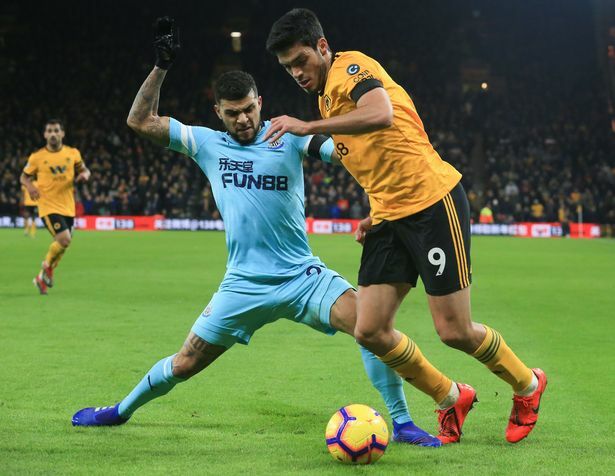 It was a serious display of faith from Benitez in Longstaff, in particular, considering that Wolves boasted Portuguese internationals Joao Moutinho and Ruben Neves in midfield. Yet the 21-year-old was excellent for United throughout; he was calm in possession while he also made a series of tackles to thwart Wolves attacks. Hayden, meanwhile, covered a serious amount of ground and used his physical approach to unsettle Moutinho. What is so refreshing is that Benitez does not have to call Mo Diame or Ki Sung-yueng straight back into the XI; the pair now have to earn their places back because the current custodians of the positions are excelling. What’s more, when United return from Spain next weekend, Almiron and Barreca will have been fully integrated into a squad which will be approaching peak fitness - and just in time for huge back-to-back home matches against relegation rivals Huddersfield Town and Burnley, too. Back in December, Yedlin had a game to forget on Tyneside against Wolves - and it was a match which ended prematurely for the American as he was dismissed for fouling Diogo Jota when he was last man. Benitez fumed after the game that VAR would have overturned the decision, but Yedlin had a lapse in concentration which allowed Jota to get past him and through on goal, and then the United right-wing-back pulled back the Portuguese forward as he was advancing towards the area. It was therefore a slight surprise to see Yedlin named in the XI here at Molineux, even given Newcastle’s recent positive form. Quickly, it became apparent that Wolves were going to target Yedlin once more - and the majority of the home side’s attacks during the first half came down that side. Both Jota and Jonny Otto regularly found themselves in behind Yedlin, while Raul Jimenez shrugged off a weak challenge from the American at one stage before advancing into the area and unleashing a low shot which Martin Dubravka had to save. It was clear that Yedlin was struggling to cope with the Wolves bombardment down his side, yet Benitez opted against replacing the right-wing-back at the interval. In the weeks and months to come, United need to make sure Yedlin is given additional protection, because defensively he is a weak link in this team. The 25-year-old was always expected to be included in the matchday 18, but the big question was whether Newcastle’s marquee January signing would make his debut as a starter or as a substitute at Molineux. It was always likely that Benitez - who is a stickler for his players to fully understand his tactical systems before starting them in difficult matches like this one - would put Almiron on the bench and so it proved in the West Midlands. 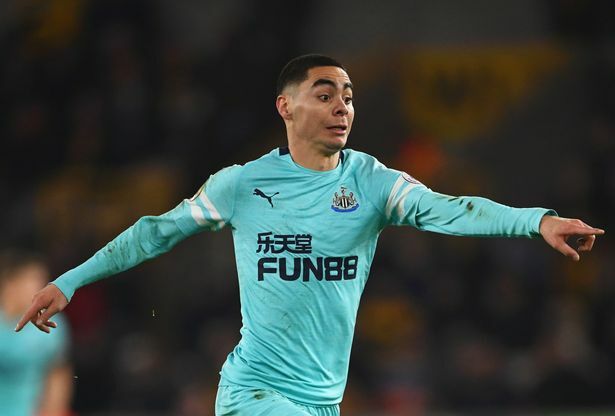 While fellow new boy Barreca missed out entirely, Benitez kept his unpredictability element in reserve to begin with, though Almiron was always likely to get his first introduction to Premier League life as a second-half substitute. With Newcastle leading and the game becoming stretched, Benitez decided to send Almiron on with 18 minutes remaining. Immediately the Paraguayan set about trying to get involved, speeding up and down the pitch, and closing down when the opposition when he could. A cross-field ball from Schar almost brought a chance for Almiron, but his first touch was too heavy, before the 25-year-old advanced swiftly from his own half and was up-ended by Joao Moutinho as he was given an introduction to the physicality of the Premier League. There were a few runs and a few nice flicks, with Almiron’s raw pace the obvious attribute on display. Newcastle fans will see a lot more of the Paraguayan in the weeks and months to come - but this was an encouraging start. Newcastle may have ended their Monday-night hoodoo back in November when they defeated Burnley 3-1 at Turf Moor, but the Magpies continue to be selected for this frustrating TV slot regardless. In each of the last 12 occasions that United have been chosen to appear on Sky Sports’ flagship Monday Night Football (MNF) show - it will be 13 by early-April once they travel to the Emirates to take on Arsenal - it has been for away matches. Evidently broadcasters are looking for the away end to be full, and for their viewing figures to be as healthy as possible; and seemingly Newcastle provide that. Magpies supporters will travel in their thousands, no matter when or where a game is played, while fans on Tyneside will also tune in to watch Newcastle in their hundreds of thousands. However, the travelling Toon Army are being disregarded and treated extremely unfairly; the substantial costs they incur and the inconvenience of having to take time off work to visit an away ground on a week day appear to be of no concern to the TV companies. Thankfully the Premier League has agreed to continue the £30 cap on away-ticket prices for another three seasons, but the next thing they need to address is the unfair scheduling of matches for certain teams. But the fact United fans had to travel back late on a Monday night after the manner in which Wolves equalised highlights why broadcasting times need reviewed.